Debunking 'Attributed by', auctions and estate sale finds. I had a crazy week! First thing's first. I picked up some amazing items this week bidding on some online auctions. It is exciting and fun. I watched a great pair of Adrian Pearsall for Craft Associates sculpted arm chairs go for $1000 and they needed foam work! But lucky for me, my competition on MCM must have blew their load on the chairs so I was able to get a few very nice high end pieces for a good price! 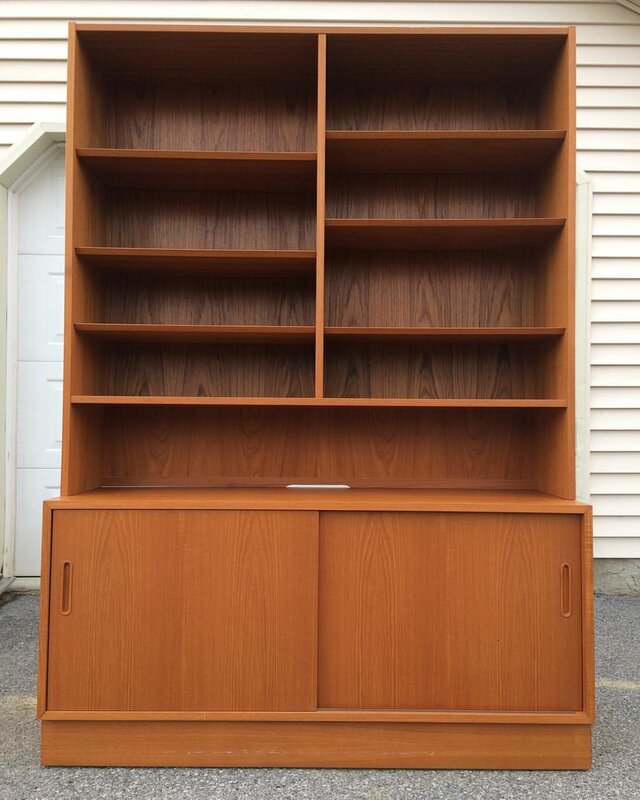 First off, I won a fabulous Danish bookcase/hutch by Poul Hundevad. It is 2 pieces with a lower cabinet that features a sliding felt lined drawer and maple adjustable shelves. The exterior is teak veneer and has adjustable open shelves. It is tall and has a lot of storage. Perfect for a pyrex display or other collectables or just housing your books. I do not typically have access to a lot of Danish so this piece was very exciting for me! It really is a great utility piece and useful in any room of the house. It is very large though and the top only fits in my Vanagon so delivery will be limited to the local region. I can help price freight companies and this will be listed on chairish by mid week most likely. Their rates with Plycon are usually very competitive. Here's a look! Beautiful teak utility piece! Available now! The next amazing item has me stumped for now. It is a smaller glass top dining table perhaps a game table. Perfect for a smaller room or nook. It has a 1/2" thick glass top which sits on 3 1" thick lucite supports and three brass cross bars or sorts. It is beautiful and really high end. Most dealers attribute this to Charles Hollis Jones, the king of Lucite. CHJ was a pioneer in using lucite in his designs. All the big dealers are attributing to him but I want to see it for myself. It turns out that MR CHJ is very much alive and has a web site. I contacted him to see if I could solve this dilemma. Mr CHJ is a total sweetheart! I think he was pleased that I asked and he did confirm that this is NOT a CHJ design. SO, sadly, it is still unknown. Perhaps it belongs to Alessandro Albrizzi, who also was doing amazing things with Lucite in the 70s and does have some similar looking pieces. I have yet to crack it. I will say that this is a very high end piece. Lucite gained popularity especially with the wealthiest folk as pieces were not blocking a view. So when you had a home full of windows overlooking the ocean, you could, in effect, see right through the furniture and enjoy the outdoors. Pretty cool concept and this little piece has opened my mind a little further. It is a smaller table so seats no more than 4. For the right spot, it will be a charmer! Regional delivery is available, and it will be showing up in my chairish shop with shipping by Plycon later this week. Do not forget that if you are in Deliveright.com service area (mid atlantic states, south eastern states) I may be able to quote them for you as well! Here is a look at this beauty! So in my correspondence with Charles Hollis Jones, he told me that is he currently featured in an exhibit at the Museum of Art and History in Lancaster, CA entitled 50 YEARS 50 CHAIRS. Pretty cool. I am trying to purchase a copy of a book about him from the museum for my resources. A very sweet man, it was very nice that he was cordial and I do think he was even pleased that I bothered to ask. Can you imagine seeing your name all over a bunch of things you did not create? Many of this era's iconic designers have already passed on and perhaps a family member is carrying on their legacy and offering insight to those who are still admiring their works. It was amazing to be able to correspond directly with one of these persons. This right here is one reason that I take time to research. Maybe I cannot determine it's origin, but crossing someone off the list is also progress! I spent all day Wednesday picking up my winnings. 2 trips to the auction house, one in my Honda van and one in our VW Vanagon! It was a great day for a drive and I got to meet up with my friend, who had also won some things. We planned to get together on Friday to pick up some other winnings in North Jersey and hit some estate sales. It worked out great and not only did we have a great day, we probably were at 7 sales and I found a bunch of awesome items! If kitsch is your thing, I have got some! I am still listing things but got through a lot in the last few days. I will add some pics here. All are currently available in my etsy shop, chairish listings are processing. It was a very exciting day! Adorable 3 pc cafe set with original vinyl sunflower upholstery! Made in Bethlehem, PA by Crestline Industries. Super cute for a covered porch or deck, sunroom! UPDATE SOLD! Very long framed print for Turner Wall Accessory. Signed Mato. This are not high end but are in demand. This print is entitled NEW YORK HARBOR SCENE. It is blue-green hues and the frame is stained blue. A real nice piece. A very pretty pair of Empire era accent chairs. These date to the late 1800s and have such great lines, I can see them blending well in a mixed era home. The red velvet is a recover and in ok shape but that can easily be changed out to match your decor. Condition is shabby, some chips and age related wear. One has a repair on the back. This vintage is best left untouched. They are charming! I picked up the rug as well. It will not be for sale at this time. I was recently involved in a discussion regarding Mid Century fake plastic plants. They are not easy to find to when I saw this one, I grabbed it! Amazing bamboo cemented in 8-9" blow mold plastic pot. stands over 50" tall! It is amazing! This was the bulk of my large finds and I have some cool smalls that will be listed soon. Reach out if you need more info about anything! Have a great week!